It is gorgeous! I was very pleased to find that it was so well made. I was very satisfied with my order thanks so much! Dress I ordered, I loved, got more compliments then ever!!! I will definetly order from you again, got a wedding in March. You will be hearing from me!!! This dress was the first thing I ordered from dressesabc and I have to say I was very happy with how beautiful it is! My only problem is I accidently got the wrong size so I have to get it altered before my wedding in December, but I am still very happy with my purchase and with how fast I received it at my door! Thanks so much! I was very unsure about ordering something so special online but when I received my wedding dress it was absolutely beautifuly made and fitted perfect. Thank you. I absolutely LOVE this dress. I did not do the custom fitting so the bust is a little big but easily altered but, I have started a new eating plan and have lost some weight. I also order my daughter's flower girl dress with dressesabc and can not wait to see it. Received my most beautiful wedding dress! At first, I was concerned with the small box it was in, but after opening it, the dress was just fine and what was also nice, is that Dressesabc also included a nice cover to hang the dress in. Nice touch dressesabc! Thank you so much for making the beginning stages of my wedding so wonderfully exciting! I have and will continue to recommend your site to all!! Oh, and did I mention that my dress is BEAUTIFUL? You're a Romantic at heart. Choosing a bridal gown rich in feminine details will lend a charming, romantic dress to your wedding day look. Think of delicate lace for its femininity and history. Sheer Silk Chiffon is ethereal and enchanting. Body skimming sheath silhouettes conjure up amourous emotion. And layers of tulle capture a dream-like quality that is whimsical and positively romantic. The romantic wedding dress collection is full of romantic wedding dresses for brides who want to feel ethereal, graceful, elegant, and beautiful. The use of light and exquisite lace fabrics and classic silhouettes come together to create beautiful romantic wedding dresses. Browse through our romantic wedding dresses where you will find gorgeous gowns in lace, tulle, satin, and chiffon. With romantic wedding dresses, the approach is a reflection of femininity. Soft and delicate. Gentle and flowing. These lace wedding gowns celebrate the love shared on a wedding day. DressesABC is a manufacturer of mid-to-high end wedding gowns, elegant wedding dresses, designer wedding dresses, and wedding fashion. Inspired by the 1950s and 60s the collection is well known for making the finest vintage wedding dresses and couture wedding dresses. Our romantic wedding dress collection is updated with modern twists to make them perfect for contemporary brides. If you are looking for a beautiful wedding dress check out our short wedding dresses, or if you are looking for the hottest new trends check out our lace wedding dresses or mermaid wedding dresses. The highest quality materials, details, and exquisite styling make each wedding gown a true work of art. 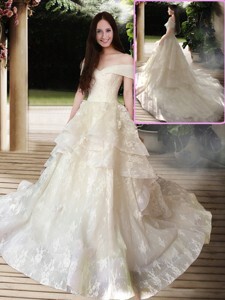 DressesABC is a romantic and classic collection of wedding dresses and traditional wedding gowns. The traditional wedding dress collection features romantic wedding dresses and classic wedding dresses. Our elegant wedding dress features a wide array of dreamy fabrics accented with distinct embellishments making each wedding gown unique. Our bridal dresses and wedding gowns are available in an assortment of silhouettes from tea lengths and high lows to mermaids and ball gowns. From the beach to a cathedral, we have the perfect wedding dress for a fairy tale wedding in any setting.